Give team members and repairmen an easy — and safe — way to reach the tops of your metal buildings with roof access hatches from Metallic Products. With its built-in curb, ability to match virtually any roof slope and panel, and range of available color options, your roof access hatch is sure to provide trusted accessibility while blending in seamlessly with your metal building. Hatch is built into roof curb to match roof slope and corrugations. 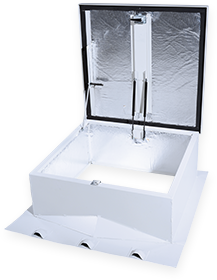 The roof access hatch can be manufactured to open in any specified direction, featuring a gas-charged opening device and automatic hold-open latch. Roof access hatch can be locked from the inside and outside. Rugged, 16-gauge Galvalume steel constructions. Corners are mitered and welded water-tight using a siliconized bronze wire for a long-lasting and non-corrosive finish. Welds are finished with a protective zinc primer. FSK faced rigid board insulation is optional. Long-lasting, heat-fused electrostatic powder factory applied to match any architectural color.